Squash poor health and low energy with these winter wonders! 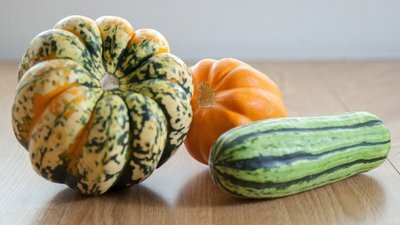 With the arrival of sweater weather, it's time to fall in love with winter squash: acorn, butternut, Hubbard, buttercup, delicate, spaghetti squash, and pumpkin! These members of the Cucurbitaceae family of vegetables are not only a great way to help tame a sweet tooth by infusing your diet with natural sweetness, but they also have a number of notable nutritional benefits. And they're highly versatile in the kitchen! Many winter squash are a leading source of beta-carotene. Once consumed, beta-carotene can be converted into vitamin A, which plays a role in supporting your immune and eye health. What's more, in a study published in Nutrition, Metabolism and Cardiovascular Disease, involving more than 37,000 participants, researchers found a significant association between higher beta-carotene intake and reduced incidence of type 2 diabetes. Winter squash is also an excellent source of fiber, particularly the soluble fiber pectin. Pectin possesses unique thickening properties, which ultimately helps to slow digestion, provide long-lasting energy, and steady blood glucose levels following a meal. Winter squash also gives you magnesium, potassium, manganese, and is an excellent source of vitamin C. And with only about 60 calories per cup, this nutrient bounty has few if any repercussions where your waistline is concerned. The most nutrient-dense winter squash are those with deeper-colored flesh, such as butternut, acorn, buttercup and Hubbard. Cut the squash in half (for butternut, slice in half lengthwise), remove the seeds with a spoon, brush the flesh with oil, and place the squash on a baking sheet cut-side down. You can also slice the squash into smaller pieces for quicker cooking, but this takes a bit more knife work. Bake at 400 degrees F until the flesh is fork tender. Cooking times will vary for different squash, but 25-35 minutes is a good starting place. At this point, the squash flesh can be scraped from the skin and eaten as-is. It can also be transferred to a bowl and mashed with a fork or potato masher. For a finer consistency, try using a food processor. You can also arrange slices of squash in a microwavable dish, cover loosely with a damp paper towel, and heat for 10-12 minutes or until tender. Now that you know how to cook squash, check out these three healthy recipes! This autumn oatmeal is the perfect start to any day, particularly a day filled with meetings and deadlines. The oats and fibrous squash provide long-lasting energy levels to help you tackle whatever lies ahead. Plus, the hint of sweetness from the squash, not to mention the natural sweetness from the cranberries and syrup, will make you feel as if you just started your day with dessert—one that's good for you! Tired of the same broiled tilapia and lemon? Give this autumn recipe a try! The subtle sweetness of the squash puree pairs beautifully with the delicate, buttery halibut. Just be careful not to eat the entire yield in one sitting! Squash post-workout soreness with this delicious shake! This high-protein treat includes a boatload of good-for-you kefir and plenty of sweetness to give you the taste you desire, and nutrients your muscles need following a workout. Sluijs, I., Cadier, E., Beulens, J. W. J., Spijkerman, A. M. W., & van der Schouw, Y. T. (2015). Dietary intake of carotenoids and risk of type 2 diabetes. Nutrition, Metabolism and Cardiovascular Diseases, 25(4), 376-381.